Over a hundred years ago, settlers journeyed to northern Idaho with high hopes. As homesteaders, farmers and others migrated onto the Palouse Prairie, near Deep Creek. The soil was fertile and forests were abundant, making it easier to cut lumber for new houses and barns. One of the saw mills in Freeze was run by Mr. Strong, who furnished the lumber for this church and helped construct it. In time, a mill churned out the materials for a blacksmith shop, a general store and a post office. C.E. 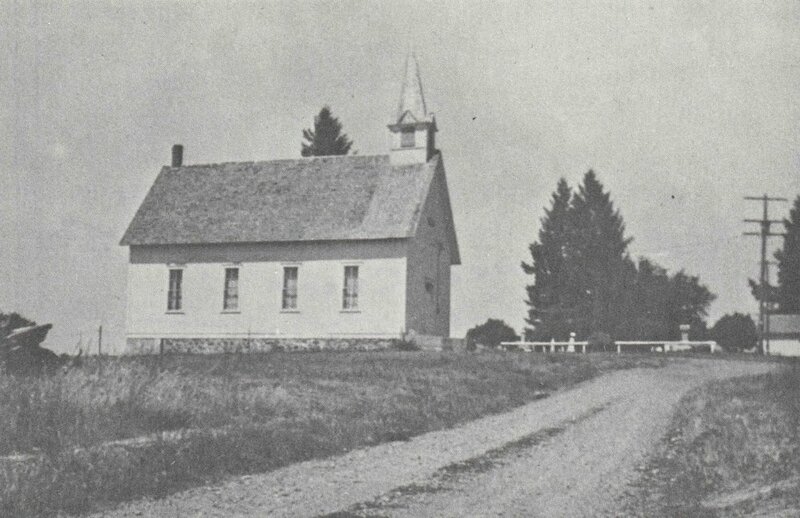 Freeze donated the land for the church and its spire rose above the farming town in 1899. Also in 1899 John Starner came to Freeze and applied to become the postmaster for the area, ranging from Garfield, Washington to Princeton, Idaho. John Starner became not only postmaster but also built a general store in Freeze. Once Potlatch Lumber Company constructed its giant white pine mill in 1905, the town of Freeze, its farms, businesses, and smaller mom-and-pop mills began to fade. In 1907 the post office burned and in 1908 the store burned. The destruction of these two structures combined with the emergence of the company town of Potlatch spelled the end of the line for the city of Freeze. Yet believers used the chapel regularly until the 1980’s, enduring its lack of insulation and aging wood stove. Over the years, the Freeze Church has been home to several congregations, and many weddings, funerals and celebrations have taken place there. The building is so prominent that National Geographic featured it in its pages in June of 1982, and Country Woman magazine pictured the church surrounded by bright yellow canola blossoms on its 2003 calendar cover. The building carries much historical significance and is listed on the National Register of Historic Places. Cook, Russ, "Early and Disappearing Communities in Latah County Idaho," (informally published, Latah County Historical Society, 1995). Renk, Nancy, National Register of Historic Places Nomination Form: Freeze Church, January 3, 1990. Ross, Opal Lambert, Landed Gentry 1871-1978 (Farmington: Washington, Opal Lambert Ross, 1979), 14-21. Looking back it’s interesting that Freeze Church fellowship was born at the beginning of a new millennium the year 2000 and as the millennium rolls over so has the fellowship at Freeze Church. Truly the fellowship is not totally new because we share the same basic Christian faith as previous fellowships at Freeze. Indeed Freeze Church fellowship has shared the same faith with those believers from the New Testament book of Acts. The event that brought new life into this abandoned building was not billed as a church reorganization or church plant. It was the surprise ending to a yearlong prayer fellowship of Lloyd Knerr, Larry Lacey, and Dennis Ownbey, meeting weekly in Tom Chaney’s wood shop at Princeton. The purpose was not to organize a new fellowship but to pray for the lost, the churches in the community and the needs of people. During this time, however, the three men became burdened for the development of a local, independent fellowship that would hold fundamental doctrines of the early church. A hint that can be observed with hindsight that God might have been at work was when these three men met with Jim Wilson, a local evangelist, for training in evangelism. In response to our concerns he just popped out with “Is anyone meeting in the Freeze Church?” Still no one talked about starting a church. After this, with hindsight, one might have wondered if God was at work when a young man, that one the three men had been ministering to mentioned that his stepfather from Oregon wanted to meet with us. We agreed, and because of Mr. Wilson’s comment about the Freeze Church building, it was agreed to get permission from the Freeze Cemetery board for the use of the building. They were eager to let us use Freeze Church because the building was falling into disrepair. They felt it would be preserved by being used, giving us wide latitude over its use and upkeep. With this arrangement we agreed to meet with the pastor from Oregon. Sunday morning was his only meeting time before his return to Oregon so Sunday morning, September 24, 2000, it was. Word got around amongst family and friends and I believe 20--30 people showed up that first Sunday morning. We had in attendance a piano player, Wanda Ownbey and Jack Gilbert led the singing. We all enjoyed traditional hymns, prayer, and fellowship. All found what they had been longing for. Afterward, when everyone had gone home except Lloyd Knerr and Dennis and Wanda, the subject of starting a church fellowship finally came up. I can remember it like yesterday standing by our cars ready to go home and Lloyd said, “What are we going to do”? I said, “What do you mean”? Lloyd said, “All these people say they will be back next Sunday ad we don’t have anyone to preach”. At this Wanda interjected, “You can do it, Lloyd, I know you can”. And Lloyd did –faithfully and very seldom missing a Sunday. Under Lloyd’s ministry, attendance grew close to 100. So that was it. Freeze Church reborn in a moment of time, or was it? Was not God working through circumstances to providentially bring this all together in His perfect time? I think so, and so it seems this new fellowship at Freeze Church is wrapping up 17 years of fellowship and ministry. We have become an elder led church that has continued through challenging times especially with Lloyd’s sudden going to be with the Lord. We continue as an Elder led and taught fellowship. Please join us Sunday morning at 11:00 for prayer, worship, and teaching from God’s word and fellowship.